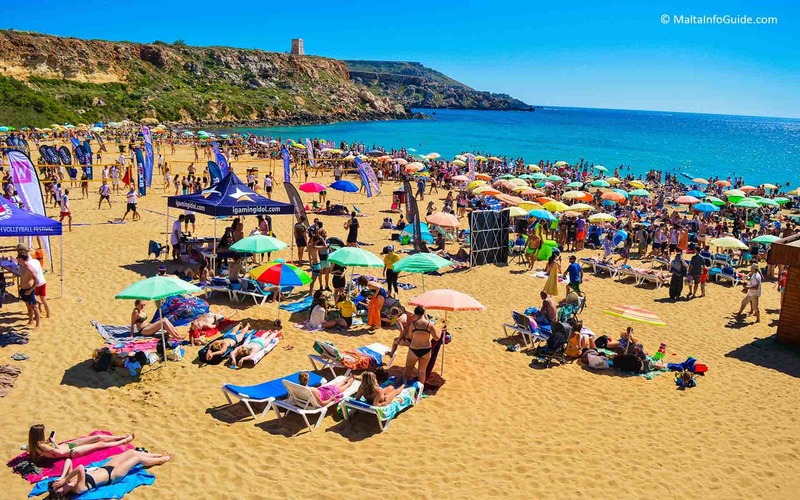 Golden Bay Malta is one of the most popular beaches on the Maltese Islands both with Maltese and tourists alike. It is located on the North West of Malta, very close to Ghajn Tuffieha Bay whilst further south there is Gnejna Bay. It is surrounded by high hills. On one side there is a watch tower dating back to the Knights of Malta, whilst on the other side there is a 5 star hotel, Radisson Blu Hotel Golden Sands Malta which has enhanced the location appearance. If you wish to enjoy a beautiful breathtaking sunset, this location is the place to come. These features makes this locality very attractive. It is also frequented during the winter months, not for swimming but for the beauty this bay can offer. For example, one can enjoy a walk in the countryside and later stop by at the Radisson Malta hotel for a relaxing coffee and some delicious pastries. During the summer holidays many families bring their children to enjoy themselves and playing in the sand. The sea by the beach is shallow and you can walk out for quite a distance till you find deeper waters. Several swimmers enjoy playing with balls and frees bees in the shallow waters. Children on the other hand enjoy playing and building sand castles by the water’s edge. This beach is also very popular in the evening, as once the sun sets, several families and groups of friends meet up at the beach for a barbecue. From the top of the hill, one can see the beach all lit up with portable lights. Revelers come well prepared with chairs, picnic coolers and food, ready to enjoy the warm summer evenings with their family or friends by the sea playing soft guitar music or disco music for accompaniment. What a relaxing time! There is ample parking although the areas beside the beach are mostly full during the peak summer months. Parking is also available further up from the bay along the main road. Ghajn Tuffieha Beach which is also called Riviera Martinique is adjacent to this bay. To get to the beach one has to descend several stairs. Once there the descent is well worth it as it is such a beautiful bay. These two locations are very close to each other and are therefore accessible using the same route and/or bus. - The facilities offered by the hotel where you can find a private beach for hotel residents. - There are also two beach facilities with a bar and restaurant including the renting of of sunbeds and umbrellas. - The hotel although located on the high ridge of the bay having a very extended view of the surroundings, has other facilities by the beach with a large pizzeria both indoors and outside open to everyone. - It is best to get the St. Paul’s bay bypass or Xemxija main road. 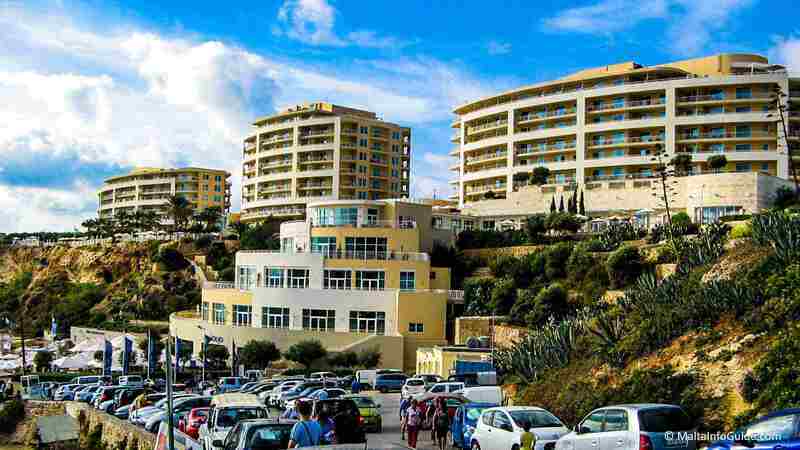 - If you are coming from St. Paul's Bay bypass, at the roundabout take the first exit and keep on for a few kilometres until you reach the beach. - If you are coming from Xemxija, at the roundabout take the second exit and keep going for a few kilometres until you reach the beach. - It is the same road which takes you to Ghajn Tuffieha Bay too. Cars can be parked in the large area reserved for parking at the top of the stairs. Parking is free however the parker do expect to get tipped. Further up there is a a public car park beside the Radisson Blu Malta. - The beach is easily accessible for disabled persons through a ramp at the lower end of the car park down to the sand. - There is a public rest room in the main car park beside the beach. - Borg Water Sports runs the water sports at Golden Bay hotel private beach. - Jet skis, paragliding behind a speedboat, water skiing, sausage rides, banana boat, paddle boats, kayaking, water skiing, sofa riding, sailing boats, canoes and stand up boards. - Not the least exclusive daily speed boat trips to the Blue Lagoon in Comino, and trips along the rocky coast up to Popeye Village at Anchor bay. All speedboat rentals are accompanied with a driver. - The sea has strong undercurrents. These are not felt all the time and usually not felt at all. However if one decides to swim further out one should take due care. - You can bring your own umbrella and chairs to the beach. Or you can rent two sunbeds and umbrella for €12.00. - They are allowed on the beach. Bar-b-que sites are to be used in order not to litter the sand. Bins are provided for the disposal of charcoal. - The erection of tents is not permitted. - Manikata is the closest village although St. Paul’s Bay is about a few kilometres away offers more amenities and is on a more frequented bus route. The Radisson Blu Resort & Spa, Malta Golden Sands which was built very recently is situated on top of the cliff overlooking the bay. It has an attractive prominent design which gives the area an up-market look. - Flavours – Sunday lunch buffet from October through June. - Agliolio – An Italian style dining restaurant which is very popular with Maltese. - Pebbles Bar & Ice Cream Parlour – Located beside the beach in the Sands Tower. - Mokka Lobby Bar & Terrace – Located in the Sunrise Tower, offers green tea, coffee,snacks, desserts and appetisers. - Lagoon Bar & Restaurant – Dine alfresco overlooking the bay. - Swizzles Bar – Serves fine wines, cocktails and non-alcoholic beverages in a relaxing environment. - Essence Bar – Over looking Golden Bay offers spirits and wine in a romantic environment. - Munchies, Bar Pizzeria & Grill – Located directly on the sandy beach, is the perfect eating and meeting place for unwind and relax. - Apple’s Eye – serving international cuisines – Located at the far top end of the bay with a wonderful location and view. - Also a small beach bar called Munches is located at the entrance ramp to the beach. Malta Scouts camping site is located behind Radisson Blu Resort & Spa. A watch tower called the Ghajn Tuffieha Tower constructed under the reign of Grand Master Juan de Lascaris-Castellar. This is one of the seven towers built in the period 1637 to 1640. Il-Majjistral Nature & History Park, Mellieha. It is Malta’s first natural national park. It contains than 426 species of plants. Ten confirmed breeding birds use the park as their home. During the period of the British Services, 1800 to 1964, the military had a large area behind the Radisson Blue hotel used for training facilities of their servicemen. At that time the bay was called Military Bay. It was surely an incredible place where the service men used to enjoy especially to the different weather conditions of their country.